Phosphorus trichloride has been used in the pharmaceutical, plastic and dye industry. This basic chemical is a pesticide intermediate as well as a precursor to chemical weapons. It is used as a catalyst, solvent and reagent in organic synthesis. 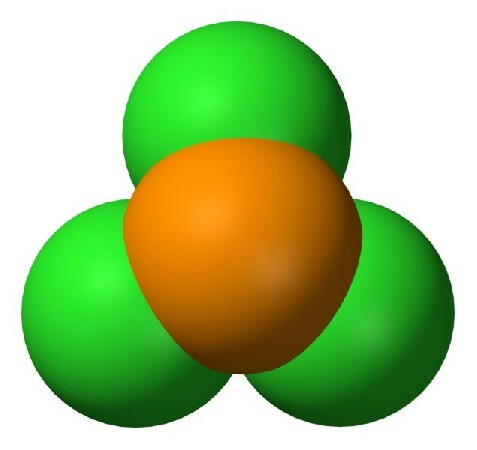 Phosphorus trichloride is a colorless to slightly yellow oily, fuming liquid with a pungent and irritating odor. It is soluble in benzene, ethyl ether, carbon disulphide and in carbon tetrachloride. It is stable, but light sensitive, incompatible with water, many metals, fluorine, acids, variety of organic materials including acids, alcohols and reducing agents. It is toxic and highly corrosive. It is used to produce sulfadiazine (SD) and sulfamethoxydiazine (SMD) in the pharmaceutical industry. It is a pesticide intermediate. The majority of production of phosphorus trichloride is used in the manufacture of organophosphorus pesticides including glyphosate, the active component of ROUNDUP (herbicide), dipterex (insecticide), methamidophos (insecticide), diazinon (insecticide), kitazin (fungicide). It is used in the manufacture of surfactants and sequestrants, including phosphorus acid, used primarily for water treatment chemicals. Phosphorus trichloride can be converted by multistage chemical synthesis to nerve gases. Therefore the production and export of phosphorus trichloride is stringently controlled under the International Chemical Weapons Convention (1993) which lists phosphorus trichloride as precursor to chemical weapons. It is used as an intermediate for the manufacturing of plastics additives, including flame retardants, plasticizers, phosphite antioxidants, and stabilizers for plastic and elastomers. For example, oxidation of PCl3 gives POCl3, which is used for the manufacture of triphenyl phosphate and tricresyl phosphate, which find application as plasticisers for PVC. Phosphorus trichloride is used as a condensation agent for naphthol in the dye industry. Used as catalyst, solvent and reagent in organic synthesis (e.g. to convert primary and secondary alcohols into alkyl chlorides, or carboxylic acids into acyl chlorides). Used during electrodeposition of metal on rubber, for making textile finishing agents and for gasoline additives. Organophosphonates, derived from phosphorus trichloride, except for agrochemical applications, are used in a variety of chelating agents, corrosion inhibitors and antiscaling agents. Used to make trioctylphosphine oxide (TOPO) – an extraction agent.